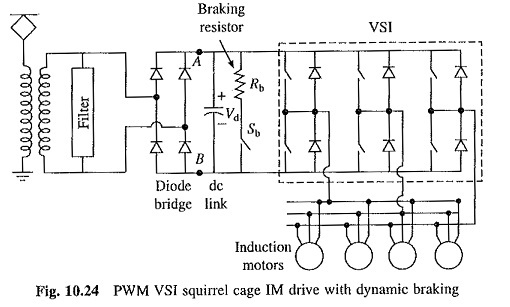 The PWM VSI Squirrel Cage Induction Motor Drive is shown in Fig. 10:24. dc link is supplied from ac source through a transformer and a diode rectifier. Because of the use of diode rectifier, regenerative braking is not possible, hence dynamic braking is employed. Operation of drive is the same as that of the drive except that regenerative braking is not possible. The drive can be provided with regenerative braking capability by replacing circuit on the left of AB in Fig. 10.24 by synchronous link converter (SLC) circuit shown in Fig. 10.25. SLC employs GTO switches for a locomotive and IGTB switches for a motor coach. It operates at unity fundamental power factor and low harmonic content in source current, which can be adequately filtered by a low cost highpass filter. Circuit of Fig. 10.25 is a 1-phase SLC, and therefore, employs 1-phase PWM inverter. The inverter and inductor Ls together form SLC. For producing a given value of Is in phase with Vs, the PWM VSI Squirrel Cage Induction Motor Drive produces an ac input voltage V1 of given phase and magnitude, as shown in phasor diagrams of Fig. 10.25(b) and (c) for motoring and regenerative braking operations respectively. During motoring operation, power flows from source through SLC, dc link and inverter into motor. Here Is is in phase with Vs and Vd and Id have polarities as shown in the figure. 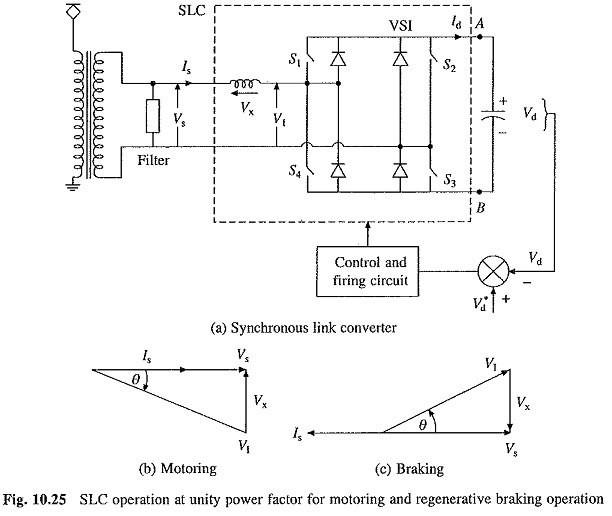 When machine operation is shifted to braking, Id reverses and Is has a phase of 180° with respect to Vs, and therefore, power generated by motor flows through inverter, dc link and SLC to ac supply giving regenerative braking. As the power supplied to the dc link is independent of power taken from it, a closed loop control of de link voltage is used to balance the two (Fig. 10.25(a)). A constant voltage across the dc link capacitor is obtained when the power supplied to the dc link equals the power taken from it. Since the SLC works as a boost converter, the closed loop control of dc link voltage ensures that the torque and power capability of the drive remains unaffected by a drop in source voltage. This SLC fed PWM VSI induction motor drive is the most widely used drive.